When I first saw this product doing the rounds on Facebook I instantly saw the appeal. I’m always keen to test out travel gadgets that make holidaying with little people easier and/or more enjoyable and I feel very strongly about teaching safety in the sun. Solarbuddies is a child friendly sunscreen and lotion applicator designed by mums and best friends Kelli Aspland and Laura Griffin. The product was created to help children apply their own lotion and is completely re-usable, re-fillable, recyclable and mess free. Solarbuddies kindly sent me one to try out in return for this review (All views are my own and those of my family). We’ve just returned from a 2 week holiday in Andalusia, Spain. With temperatures regularly hitting 43 degrees (and some! ), it was vital that we taught sun safety to our children. Our 3 year old has become fiercely independent over recent months (I thank the new Montessori nursery we’ve recently moved her to!) and so anything that could allow her the independence she so craves and prevent the tantrums that follow if we try to help, had to be worth a shot. So after two weeks of road testing our solarbuddies we can firmly say we love it! Here are the pros and cons as we see them (and yes I did ask my 3 year old!). 1. The main advantage of this gadget is the independence it gives children. Our daughter loved (and asked!) to apply her own sunscreen. We would then double check and re-apply if need be. She coped really well and the coverage seemed excellent (and perhaps most importantly she didn’t burn at all). Oh and tantrums were almost non-existent! 3. Wastage was far less. Gone were the days of squirting too much cream on your hand and then having to wash it off! 4. Easy to take in a bag for day trips – it’s small and compact and therefore easy to pack in a small bag. 5. 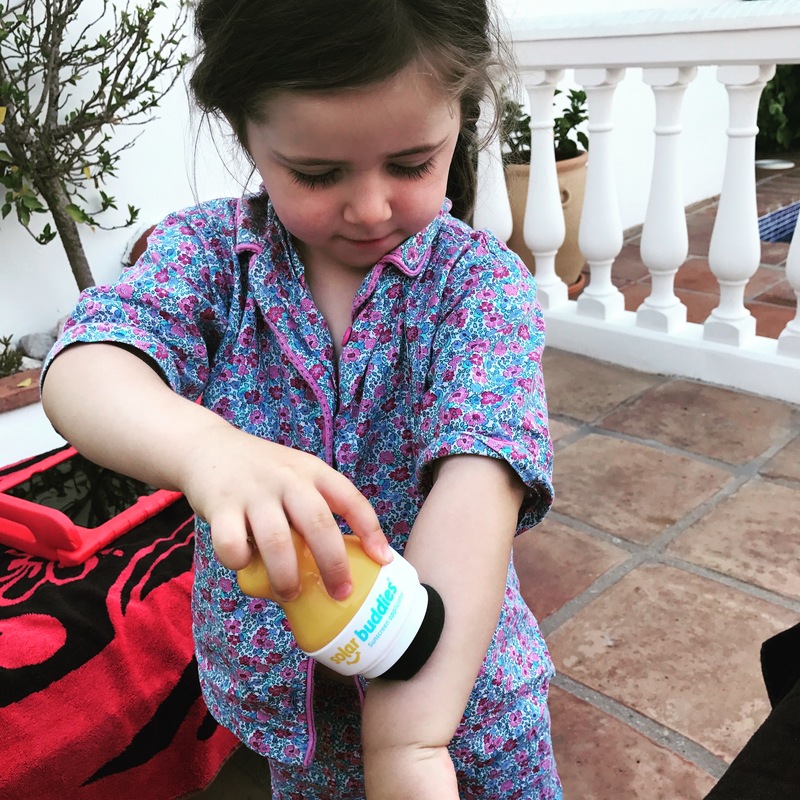 You can use whatever cream suits your child – the little yellow container takes 100ml of suncream (so therefore also suitable for hand luggage on a plane!). They do advise that children don’t share them (but I have to say ours did!). 6. Potentially useful to get around the no suncream rules at British schools. It would easily fit in their school bag and they could then apply during the day as and when needed. 7. Price – At only £7 they are affordable. You can buy them direct via the solar buddies website but they are availiable at a number of other outlets (including Jo Jo Maman Bebe – but they charge £8!). 1. We found it hard to apply to our daughter’s face – the sponge bit was slightly too big and it was tricky to apply around her eyes etc. Perhaps as she gets bigger this will be less of an issue. 2. You have to replace the sponge applicator every 4-6 weeks depending on usage. The replacement applicator heads are £3 (or less if you buy more than one). I’ve since clarified with Solarbuddies that you only really need to replace the sponge applicator if it appears damaged or worn in anyway. They do suggest you wash them thoroughly after use to stop continued sunscreen buildup in the sponge. All in all a wonderful gadget that I now wouldn’t be without. It has pride of place in our kitchen….on the off chance that the British summer re-appears! If you’ve enjoyed reading this review, and I hope you have 🙂 , then don’t forget to follow me on Facebook, Twitter or Instagram.